Rev. Dr. John Kleinig is an esteemed theologian who is a pastor of the Lutheran Church of Australia. He is also a professor emeritus at the Australian Lutheran College in the University of Divinity, Adelaide, Australia. In addition to being a published author, Rev. Kleinig has taught pastors and missionaries serving in various countries, including the United States, Canada, New Guinea, Malaysia, Singapore, Thailand, India, and South Africa. We recently caught up with Rev. Kleinig to talk about life, writing, and his latest project, the Hebrews Commentary, now available in the Concordia Commentary Series. What sparked your interest in the Book of Hebrews? When I was young, my home congregation was called Pilgrims’ Lutheran Church after the description of the patriarchs as pilgrims and strangers in Hebrews 11:13. The fascinating image of human life as a pilgrimage from earth to heaven first sparked my interest in this book. But it was only much later that I studied it more closely in connection with a Bible study for a national pastors conference, a course on worship in the New Testament, and then, much more comprehensively, as part of a commentary for Concordia Publishing House on Leviticus. What unique contribution does Hebrews make to our understanding of who Jesus is? This written sermon teaches us about the exalted Lord Jesus as our anointed High Priest who mediates between us and God in the Divine Service. He brings the holy gifts of God to us on earth and brings us together with Himself into God’s holy presence in heaven. How does Hebrews relate to the worship practice of the corporate church? How does it relate to the holy life of Christians? The author of Hebrews teaches his congregation about their participation in the heavenly service together with Jesus, the angels, all Christians around the world, and the whole communion of saints, as they listen to God’s Word and receive Holy Communion. Through His holy body and blood, Christ makes and keeps them holy. They, thereby, are holy people who share in God’s holiness as they stand before Him in the heavenly sanctuary. How would you summarize the Book of Hebrews in ten words or less? Through Jesus, we have access to heaven here on earth. Let’s talk about your writing process. How does writing a commentary differ from other writing projects you’ve completed? It was much more demanding linguistically, exegetically, and imaginatively than anything else I have studied. Its use of Greek is much more sophisticated and nuanced than any other book in the New Testament. Its interpretation of texts from the Greek Old Testament is very exacting and yet quite surprising. Its constant comparison of the Divine Service in the church with the Divine Service in the Old Testament stretched my imagination to the point of dazzled amazement. What were some unique challenges you faced while completing this project, and how did you overcome them? What did you enjoy most about writing this commentary? Initially, I had some difficulty in following the chain of argument in this written sermon because the grammar and syntax of the text was so complex. But I overcame that in two ways. First, I learned how to use Wallace’s Greek Grammar: Beyond the Basics. Then, after I had done the initial linguistic spade work, I began to read it out loud to myself to discover how it did not just appeal to the understanding of its hearers but also their emotions and religious imagination. I enjoyed writing this commentary much more than anything else I have written because I did not have to write it on the run in snippets, but could, due to my retirement, devote my full attention to it for seven years. Let’s talk about your life in ministry. When and why did you decide to enter the ministry? I always had a vague sense that I was called to be a pastor, but it was only when I was an undergraduate student of the humanities at Adelaide University that it became clear to me that I would never be happy doing anything else, but would drift restlessly through life, like Jonah trying to escape God’s call to preach to the people of Nineveh. What have been some of your greatest joys in serving as a pastor and theologian? I have enjoyed teaching the whole of the Bible relevantly to young and old, caring for people pastorally with God’s Word in the highs and lows of their lives, and leading people reverently in worship together with Jesus. For the Christian who is a bit intimidated by a large commentary, yet desires a deeper understanding of Scripture, how would you recommend they dive into this volume? It seems like people often reserve commentaries for pastors and theologians, but how would this volume benefit every student of God’s Word? As pastors, teachers, moms, dads, and students read your commentary, what is one important message you wish your readers to take away from this volume? I would like them to rejoice that they have access to God’s presence and His gifts to them whenever they go to church to hear God’s Word and receive Holy Communion. 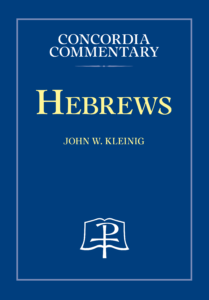 To order your copy of the Hebrews Commentary, visit cph.org or call 800-325-3040.